← It is new, it is progress! In his country practice, traveling miles by horse and carriage in all weathers, Ephraim began to feel the toll of West Virginia’s misty autumns, snowy winters, cloudy springs and humid summers. He would come home dog tired. He could not avoid the reality of approaching seventy and the equal reality of the need for income. His eldest two children were working but there were five more, the youngest only eight. He began to brood. He hated being an old man. He opened the envelope, grunting in satisfaction at finding the banker’s draft — Helena had said the coal bill was due. And then as he read the letter his hands began to tremble. Looking at it again he went to the door and called Helena. ‘Is something wrong?’ she hurried from the back parlor. ‘I wondered if you would come out for a walk with me later.’ He would tell her the news gently, in a pleasant setting. Ephraim makes one last move — both in career and location. In Chapter 38, The Gleaner, after recuperating from a serious illness he accepts the offer of an editorial post with the journal of the Abbott Alkaloidal company. He and the family moved to Ravenswood, Chicago in 1899 where he lived and worked successfully until his death in January 1913, in his 85th year. 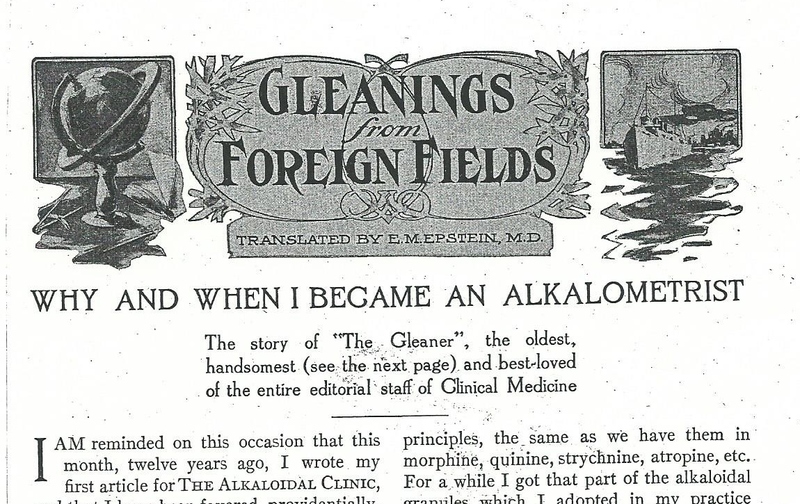 The byline in his article above: The story of ‘The Gleaner,’ the oldest, handsomest and best-loved of the entire editorial staff of Clinical Medicine (Date ca 1906). Gleanings from Foreign Fields was Ephraim M Epstein’s regular column of translations from European medical journals. He also ran the Abbott medical library, fostering research.